An expert panel of the Union environment ministry has justified the setting up of coal-fired power plants in Ratnagiri district of Maharashtra. It has said the thermal power plants may prove beneficial for mango plantations as the trees could draw sustenance from the oxides of sulphur and nitrogen emitted by them. 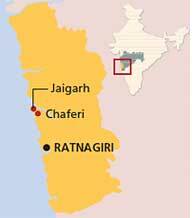 Ratnagiri is famous for its Alphonso mangoes and farmers here export their produce to Europe. The observations of the expert appraisal committee (EAC) have riled farmers and activists who have been protesting the setting up of two thermal plants of combined capacity of 4,400 MW. The Union ministry cleared the projects in Chaferi and Jaigarh villages in 2007 despite stiff resistance from farmers. Both plants are being set up by private power producer, jsw Energy Ltd, owned by the Jindal group. At the EAC meeting in December 2009 in Delhi, the panel vice-chairperson, C R Balu, observed that emissions from the proposed thermal power plants can be compared with those from vehicles. As there are no thermal power plants operational in the district, the panel decided to equate vehicular emissions with thermal power plant emissions. The panel observed that mango plantations in the vicinity of major roads with heavy vehicular traffic “seem healthier than those further away from town”. It said the reason could be that sulphur dioxide emissions get converted to sulphates and nitrogen oxides into nitrates which may be good for the mango trees and other vegetation. Balu added the effect of emissions on flowering and fruit formation needs to be studied further. He also alleged that local opposition to the power plants is politically motivated and biased. Villagers had challenged the environmental clearance to the projects before the National Environment Appellate Authority (NEAA) but lost the case. They then moved the Delhi High Court against the NEAA decision. Last September, the Delhi High Court had asked the expert panel to re-examine the environmental clearance to the power plants on the appeal filed by the villagers’ forum, Ratnagiri Zilla Zagruk Manch. Activists described the expert panel observations as a cruel joke. Jayendra Parulekar, convenor of citizens’ group Konkan Vinashkari Prakalp Virodh Samiti, said the thermal plants will destroy the forests, biodiversity and farms of Ratnagiri. A representative from FoodCert, which issues certificates under the European Retail Parties Good Agricultural Practices, has said that in case of pollution from the thermal power plants, the certificate cannot be granted. This certification is a must for entry into European markets (see ‘ Thermal Power projects threaten Ratnagiri’s Alphonso mangoes’ , Down To Earth, Jan 31, 2008).